Born 1941 tel +45 2684 5034. The Scandinavian landscape in all its shapes and forms is my greatest source of inspiration. In my watercolours I seek to convey impressions from my frequent visits to Danish and Swedish unspoiled sites. Hopefully they will give the onlookers inspiration for their own memories and thoughts or perhaps simply create some peace of mind by dwelling in the silence of a beautiful landscape.To me the watercolour poses the greatest challenges and it is perfect for the impressions I wish to convey in my pictures. I arrived at this conclusion after many years with oil painting and graphic works. Have participated in many juried exhibitions in Denmark and abroad. Nordisk Akvarelselskabs jubilæumsudstilling 1. October 2009- 13. March 2010. Skåne Kunstrunden 2012 in Mårten Pers Källa, Sweden. Design for several book covers commissioned by publishers. Design for GO-CARD on two occasions in 2007. Included in the art book " 101 dansk kunstner"
Her parents persuaded Mona Sloth to take an education in book-keeping even though her heart was set on becoming an artist. She married early and raised a family, but when the children grew older, she took courses at the Danish Graphic Design School and started working as a graphic illustrator. She also joined Grafisk Værksted, a Danish centre for graphic arts where she worked with various printmaking techniques. At one point she developed an allergic reaction towards some of the chemicals used and was forced to try and find other ways of expressing herself artistically. The leader of Grafisk Værksted, Tove Marie Petersen – a qualified artist from the Danish Art Academy who also taught watercolour - suggested this technique to Mona, and since then she has been a very keen watercolour painter. 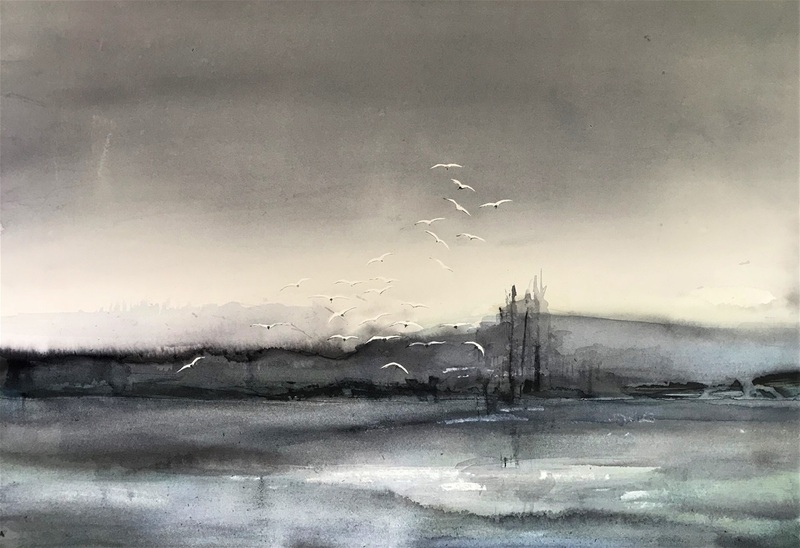 Primarily she paints landscapes with a distinctive Scandinavian touch limiting her choice of paints to blue and earth colours in a soft, warm tone. She is a very active member of NAS in Denmark and many times participants of workshops and other painting events gather round her to see her create these wonderful sceneries. She will generously show them how she does it, but will always refer to Anna Törnquist in Sweden as a good teacher of many of the techniques that she uses. Mona paints en plein-air but also uses her own photos as reference. Her works are bold, free-flowing semi-abstract personal interpretations that convey moods and feelings rather than any kind of realism, but they still have a distinctive, often recognizable motif. Contrasts are very important to her as is harmony. She may make use of various methods such as scraping in the paint to create lines, spraying/washing out parts of the painting or sprinkling salt in the wet paint, but she always returns to the traditional art of wet-in-wet watercolour painting where most of the work is done in one process while the whole piece of paper is damp. She has been very busy these last couple of years, exhibiting and organizing watercolour workshops but has now promised herself one year off – giving her much more spare time to concentrate just on her own painting.